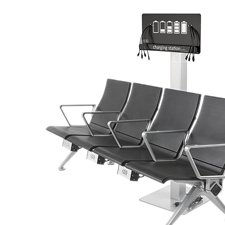 Hubbell’s On-the-Go Cabled Charging Stations require minimal assembly and install easily. There are two styles available; a semi-permanent wallmount unit or a relocatable floor stand. The standard configuration includes (3) Apple® Lightning, (3) Micro USB and (2) USB Type-C cords, allowing for 8 devices to be charging at once, without slowing charging speeds. Hubbell's On-the-Go Powered Seating Boxes fulfill customers' need for power accessibility. As the use of electronic devices has increased, the demand for charging has followed. Powered Seating Boxes provide an easy means of charging user's devices while meeting custom space requirements. Seating boxes can easily be attached to waiting area seating arrangements, conference tables, lecture halls, anywhere convenient power is needed. Hubbell’s On-the-Go Power Charging Pedestals ships ready to install with four 20A 125V tamper-resistant USB Type A and Type-C combination duplex receptacles, and ¾ inch NPT hub in the base and 36 inch long wire leads accommodate all installations when fed from the floor below. The pedestal can also be mounted and wired over one of Hubbell's flush round floor boxes or single gang rectangular floor boxes. Its shallow design allows the pedestals to be mounted between most back-to-back transportation seating arrangements.